Several new reports illustrate how Iran and Syria continue to aid terrorist groups that target Israeli civilians by providing weapons and terrorist training to jihadist organizations on Israel's borders. In Gaza, Hamas and other terror groups have fired thousands of rockets and missiles into neighboring Israeli communities since Israel unilaterally withdrew in 2005. They continue to be re-supplied by Iran and Syria. In Lebanon, Hizballah has received massive supplies of weapons from Tehran and Damascus, including large quantities of missiles and rockets, as well as unmanned aerial vehicles and attack aircraft. Both organizations are committed to Israel's destruction and have gone to war with Israel in recent years: Hamas in 2008/2009 and Hizballah in 2006. And with Iranian and Syrian help, both terror groups are making substantial improvements in their weaponry like this and this. Hizballah toppled the Lebanese government Wednesday, as ministers associated with the group withdrew from the Cabinet to protest a United Nations tribunal's investigation of the 2005 slaying of former Prime Minister Rafiq Hariri. Hizballah is demanding that current Lebanese Prime Minister Saad Hariri, the slain leader's son, disavow the tribunal, which is expected to accuse members of the Tehran-backed group of complicity in the assassination. Analysts are unsure about whether the political crisis generates internal violence in which Hizballah has the upper hand or prompts a period of political stagnation. Even before the Beirut government's collapse, it has been "an open secret that the Syrian-Lebanese border has been deliberately left wide open by Syria in order to guarantee the supply of war material to Hizbullah in Lebanon," Col. Jacques Neriah, formerly foreign policy advisor to Israeli Prime Minister Yitzhak Rabin, writes in a new report for the Jerusalem Center for Public Affairs. The Lebanese Army's ability to discharge its responsibilities is likely to be further undercut if there is a prolonged Lebanese political crisis during which the country is run by a caretaker government. Israeli and Western intelligence services have long been aware of Tehran and Damascus' involvement in Hizballah's weapons buildup. Damascus Airport "has been identified as the transit point for airlifts of Iranian arms that were subsequently transferred to Hizbullah via the open Syrian-Lebanese border, under the supervision of the Syrian security services," according to Neriah, who also served as deputy head for assessment of Israeli Military Intelligence. "The Army is thinly deployed along the 359 km [approximately 225 miles] border with Syria and is unable to block the movements of Hizbullah fighters or Iranian Revolutionary Guards. Any thoughts of attempting to block the border must also take into account the presence of belligerent Palestinian units such as the Popular Front for the Liberation of Palestine-General Command and Fatah Intifada that answer to Syria." The Lebanese Army's ability to discharge its responsibilities is likely to be further undercut if there is a prolonged Lebanese political crisis during which the country is run by a caretaker government. A $100 million military aid package for Lebanon was held up temporarily by two Democrats, Nita Lowey, N.Y., and Howard Berman, Cal., but they withdrew their opposition in November after the Obama administration assured them the aid would not end up going to Hizballah. House Foreign Relations Committee Chairwoman Ileana Ros-Lehtinen, R-Fla., indicated those assurances may not be enough. She questioned whether there has been any benefit from previous military aid to Lebanon. "The Lebanese government and military are not addressing the Iran-Syria-Hezbollah axis's growing threat to Lebanon's sovereignty and security," Ros-Lehtinen said in August. "Instead, they have focused on what they call 'the enemy' – our democratic ally Israel – and now an Israeli soldier has been killed as a result." Revolutionary Guard activities in Lebanon are overseen by Iranian Gen. Hassan Madavi, commander of the Guards' Lebanon Corps, who is based in Beirut along with other Iranian officers. Since the 2006 war in which Israel destroyed much of Hizballah's military infrastructure in Lebanon, the group has rebuilt and strengthened its missile forces targeting the Jewish State. Before the war broke out on July 12, 2006, Hizballah had 15,000 missiles; the Israeli government recently estimated Hizballah has an arsenal of close to 60,000 missiles. Approximately 15,000 are on the Israel-Lebanon border, and some of them can reach Eilat on Israel's southern tip, according to Israeli Ambassador to the United States Michael Oren. In 2006, many of these missiles "were basically out in the open," enabling the Israel Air Force to neutralize them, Oren said. But since the Israel-Hizballah ceasefire took effect in August 2006, the terror group has moved its arsenal into densely populated civilian areas. He added that the new Hizballah arsenal is "far more accurate" with rockets capable of carrying much bigger payloads (and doing more damage) than the ones fired at Israel in the summer of 2006. "Today, those same missiles have been place under hospitals, and homes and schools because Hizballah knows full well that if we try to defend ourselves against them, we will be branded once again as war criminals," Oren said in September. "We know Hizballah has in violation of U.N. resolutions once again penetrated southern Lebanon, transformed entire villages into armed camps and put in about 15,000 rockets along the Israeli border." Last spring, Western intelligence services learned about a new logistics network built by Tehran and Damascus to transfer weapons from Iran to Hizballah forces in Lebanon. The network was built after the February 2008 assassination of Hizballah terror mastermind Imad Mughniyeh. In a news conference last April, Defense Secretary Robert Gates said Syrian and Iranian rocket and missile shipments have provided Hizballah with far more rockets and missiles than most governments in the world. And this is obviously destabilizing for the whole region, and so we're watching it very carefully." Hizballah says it has also obtained unmanned aerial vehicles and attack aircraft from Iran as well with the assistance of the Revolutionary Guards. Sources close to the group's leadership have cited these as examples of the "surprises" it is planning during any future war with Israel. Meanwhile, on Israel's southern border, Iran and Syria are working to strengthen Hamas' military power. Israel's Shin Bet reported that during 2010, a considerable amount of weaponry "has been smuggled into the Gaza Strip," including hundreds of rockets, "about a thousand mortar shells, dozens of missiles, tons of standard explosives, and tons of raw material for explosives production. "The smuggling route starting in Iran and passing through Sudan and the Sinai continues to be a key element for Palestinian terror organizations. Iran plays a key role in assisting the Palestinian terrorist organizations and Hizballah to strengthen their military capabilities – it provides high quality weaponry; it funds training for military activists, and it directs terror activity through various Arab countries, especially Syria and Lebanon." 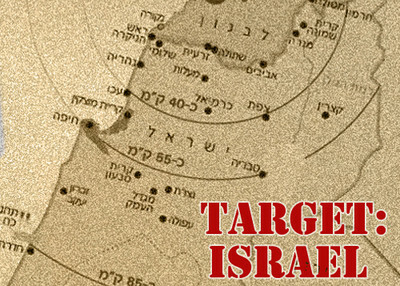 Read more about Iran, Syria and their assistance to jihadists targeting Israel here and here.